To stop sabotaging your relationships you need to think before you act. The next time you’re feeling anxious or starting to panic because you haven’t heard from your man, or because he rejected you, yelled at you, or sent a text or e-mail that upset you, pause and breathe deeply. When your mind starts racing with wild thoughts of retaliation, rebuttal, or revenge, stop and breathe deeply. Say to yourself, “Push the pause button.” Whenever I have a client relating his fear—his “what if’s” and assumptions—I always tell him to push the pause button. I frequently tell myself that too; it works, and that’s why I’m passing it on to you. It won’t solve all your problems, and it won’t prevent future panic attacks, but it will get you through this moment and today and prevent any relationship damage. Keeping your thoughts in the present is another great tool for calming anxiety. Don’t think about anything that you can’t do for yourself right now, in the moment. Your thoughts control and create your feelings. Keep your thoughts off of what is causing your anxiety. 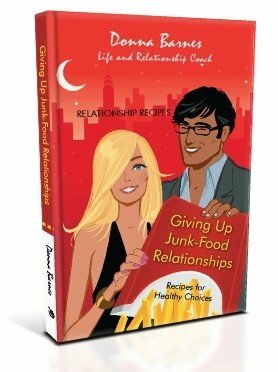 I wrote my book Giving Up Junk-Food Relationships to help you stop sabotaging your relationships and create happy, lasting relationships.